Having reignited their Roses rivalry in the more sedate environment of the County Championship this week, Lancashire and Yorkshire will do battle in the blood and thunder T20 Blast with the Red Rose looking to claw back those much-desired bragging rights. Defeat to the old enemy at Headingley will have hurt Lancashire. Early wickets left the hosts at 74-5 in the first innings and 89-6 in the second, before Yorkshire rallied to post 308 and 236. An underwhelming first innings with the bat from Lancashire ultimately cost them the game as Ashley Giles’ league leaders lost their second successive away game. But after six games of the championship, Lancashire and Yorkshire are tied on points at the top of the Division One table – leaving the battle perfectly poised as the Roses rivalry moves to the cauldron of coloured clothing. It was Lancashire who had the better of the clash in the T20 Blast last season, winning both encounters on their way to clinching a first T20 title. Jos Buttler’s sensational 71 from 35 balls dragged Lancashire to the most improbable of last-ball victories at Headlingley, before the Lightning posted their highest ever T20 total of 231 in a dominant victory at Old Trafford. But Lancashire’s recent home form in the T20 Blast isn’t particularly impressive. Successive defeats at the start of their title defence this season means they have won just one of their last six at Old Trafford. Giles’ defending champions have been on the end of two thrashings so far this campaign. 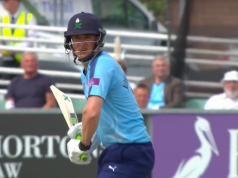 Two below-par first innings totals against Derbyshire and Durham have been knocked off at a rapid pace, meaning the Lightning are left languishing at the bottom of the table. Jason Gillespie’s side have also lost their first two and continue to struggle in T20 cricket. Yorkshire were on the receiving end of a thumping at the hands of Leicestershire in their first match of the season. Chasing 174, the Vikings were skittled for just 120. Against Worcestershire, 72 runs in the last four overs got them to a respectable score, but the hosts cruised to a six-wicket win. There will be no shortage of world superstars to excite a sell-out crowd at Old Trafford. New Zealand opener Martin Guptill made 72 on Lancashire debut last weekend and lines up alongside compatriot Neil Wagner and England star Buttler for the Lightning. Yorkshire have been boosted by England’s decision to allow Jonny Bairstow and Joe Root to play in this prestigious fixture and the England pair will join World T20 teammates David Willey and Liam Plunkett in a strong Yorkshire line-up. This is a contest that catches the imagination of cricket fans of all ages and always delivers a phenomenal atmosphere inside Old Trafford. With so much talent on show, in front of the sky cameras, expectations are high for a top class contest between these two Roses rivals. Lancashire have been below-par with both bat and ball in their two defeats so far. With the bat, they simply haven’t posted a total that was ever going to be defendable. But by the same token, the bowlers have been thrashed to all corners of Old Trafford. One man who could help them with both of those problems is all-rounder Tom Smith. Omitted from the squad last week due to fitness concerns, Smith is expected to return to open the batting alongside Guptill and provide another seam option for skipper Steven Croft. With a T20 strike rate with the bat of 121.38, the left-hander could provide some valuable firepower for the Lightning. Yorkshire have their fair share of all-rounders and one man who is crucial to their efforts with bat and ball is Liam Plunkett. The right-arm fast bowler was part of the tail that frustrated Lancashire in last weeks Championship win, posting 57 in the second innings, and is fresh from playing a key role in England’s World T20 campaign. Plunkett showed his T20 batting prowess against Worcestershire on Thursday, smashing 34 from just 10 balls and will be a key man for Yorkshire in the Roses clash. On the back of two straight defeats, there may well be tweaks to Lancashire’s side and batting order. Smith could return to open the batting in place of Alviro Petersen while Jordan Clark may play his first game of the season to provide another all-rounder option. Lancashire will probably continue to field three spinners, despite Arron Lilley and Stephen Parry taking a hammering against Durham last week. Neil Wagner will be the sides main seam option. With Root back in the side, pressure will come on to the likes of Jack Leaning and Will Rhodes, while Andrew Hodd will make way for Bairstow. Adil Rashid batted at number three against Worcestershire, an experiment that failed, and he will surely drop down the order again. James Wainman and Ben Coad are expected to continue as pace options, alongside the established seamers Plunkett and Tim Bresnan. There will be some rain around Manchester tomorrow but the game is set to be dry. Old Trafford can offer pace and bounce but some T20 pitches have been slow and low, aiding spinners and seamers who bowl plenty of cutters.